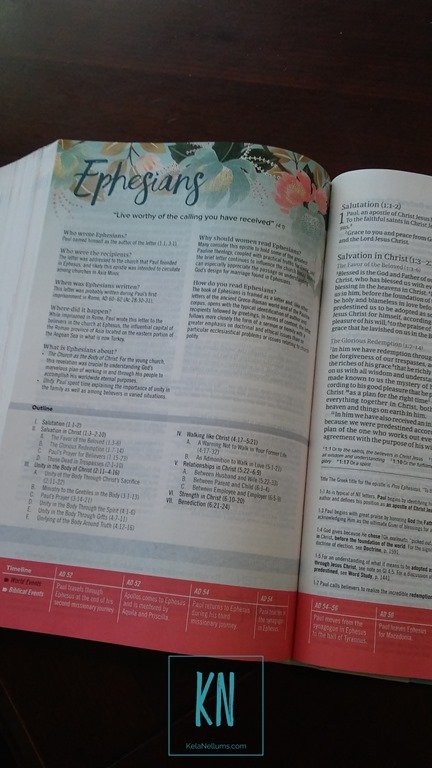 There are so many features that I really enjoyed from using the new CSB Study Bible for Women! The pretty Faith and Glory font was the first thing to catch my eye because it’s the secondary font that I use for my branding! But that isn’t the only thing! There are so many fascinating features in this study Bible! I’m very particular about choosing a Bible and I’d like to think that this is one that I would’ve picked this version up had I been shopping for a new Bible. 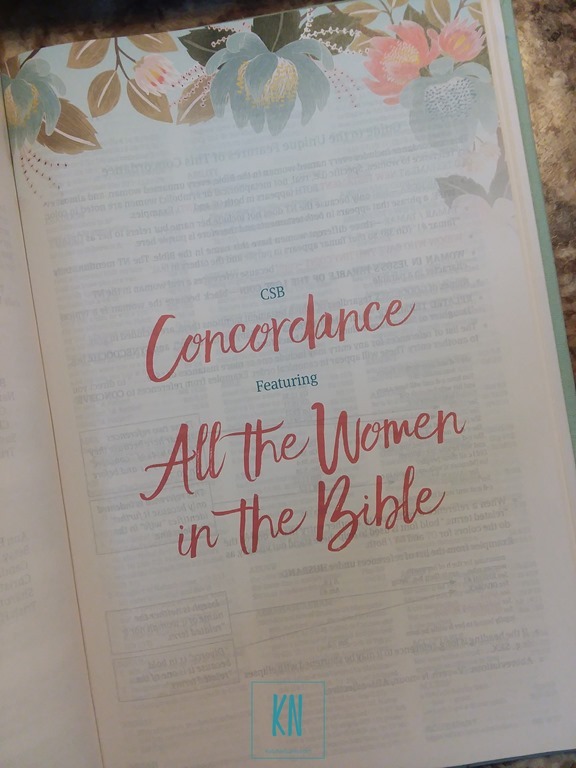 – Character Profile and Concordance featuring all the women in the Bible. 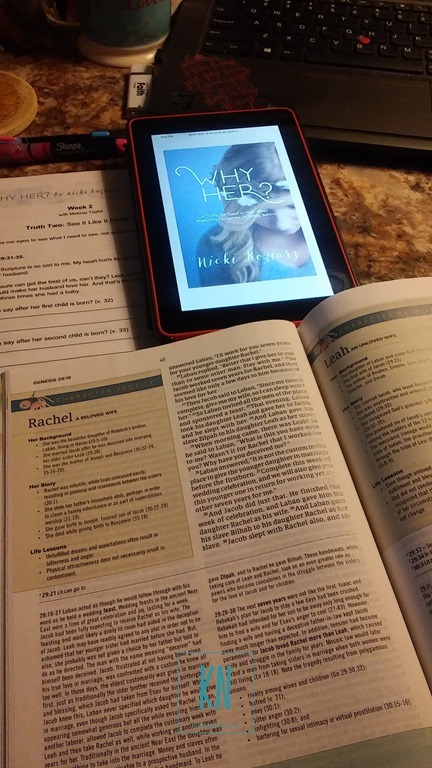 [ I participated in the “Why Her?” online Bible Study recently and used this Bible specifically for it. The CSB Study Bible for Women was very instrumental in helping me to dig even deeper into the stories of Rachel and Leah]. – The “Word Study” throughout the Bible. It helps to see key words in Scripture defined by their Greek and Hebrew usage. – Biblical Womanhood is also helpful in life lessons. – Answers to “does the Bible REALLY talk about this?” kind of Hard Questions. I also wanted to be sure to talk about how this Bible does with highlighters, pens and markers. The feel of the paper is almost newspaper-like; as in no gloss or shine. 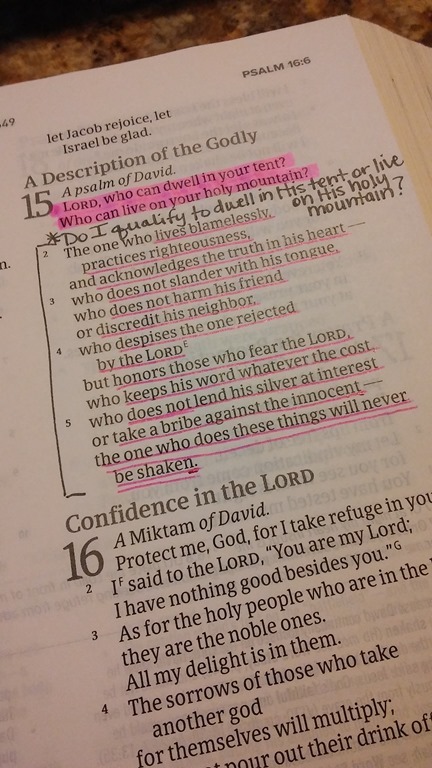 I use the Sharpie Liquid Highlighter now when highlighting in my Bible, and I use both the Sharpie Pens and Zebra Fine Ball-Point pens for writing & underlining. Bleed through was very minimal with this study Bible. There are only two things that I’m not crazy about with this particular style, but I’m sure that it’s not an issue with the LeatherTouch version, and that’s the light color of the hardback. It soils easily. Also the edges of the hardback easily crease and indent. I advise to be mindful of how you store your Bible when not in use or place it in a Bible cover. But, thankfully, that has NOTHING to do with the integrity of the content! . I’m so glad that you’ve stuck around to this point of my review! And for that, I’d love for you to click on over to enter the GIVEAWAY of the CSB Study Bible for Women! This would be a wonderful addition to your Bible collection or to gift to a friend! Also, find out more by watching this video! I received the CSB Study Bible for Women (Light Turquoise/Sand Hardback edition) from Frontgate Media and B & H Publishing Group at no charge in exchange for my honest review. Visit B & H Publishing Group for specific details and to download a sample pdf. * I’ve included affiliate links throughout this post that will lead you to Amazon. I do not charge any additional fees for you to purchase items. This simply means that I will possibly be compensated a small percentage of your purchase. Thank you in advance for supporting this ministry.